Learn and explore the use of algebraic identities or formulas to evaluate the numerical expressions with this series of worksheets. 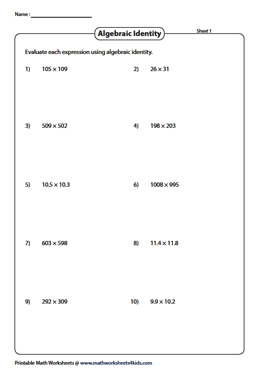 A number of worksheets on topics like evaluate using (a+b)2, (a-b)2, (x+a) (x+b) and a lot more are presented on this page. High-school students should express each numerical expression in an appropriate algebraic identity form and then evaluate the expression. 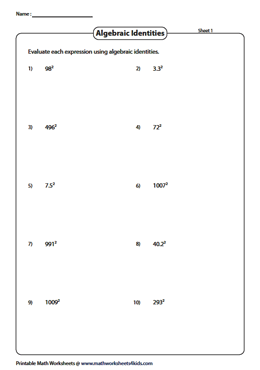 This assembly of worksheets features whole numbers and decimals raised to the power of two. Rewrite the number as a sum or difference of two numbers and apply the identity (a+b)2 or (a-b)2 to arrive at the solution. All questions are represented in the form a2 - b2. Use the expanded form (a+b) (a-b) of the identity a2 - b2 to evaluate these numerical expressions. Work out the product of two numbers with the help of the identity a2 - b2. 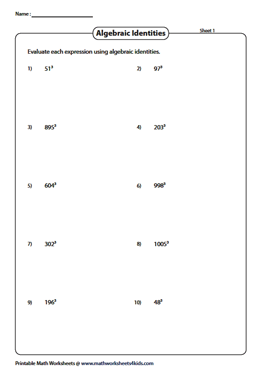 The worksheets in this section are helpful in finding the products of larger numbers with ease using an algebraic formula. 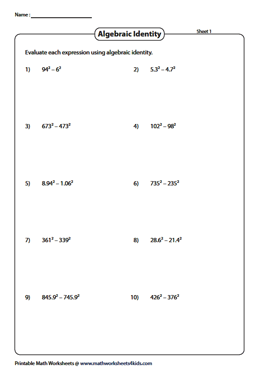 Utilize the identity (x+a) (x+b) = x2 + (a+b) x + ab to solve the problems enclosed in this high-quality printable worksheets. Rewrite each expression as (x+a) (x+b) and evaluate using the algebraic identity. Write the given number in the form of (a+b) or (a-b) raised to the power of 3. Apply the identity (a+b)3 or (a-b)3 to evaluate the numerical expression. 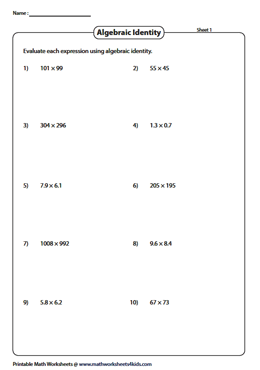 Access this batch of consolidated worksheets to brush up your skills in applying algebraic identities to evaluate the mathematical expressions. 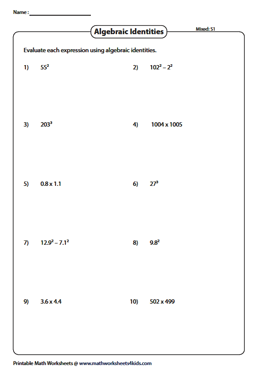 Use the correct algebraic identity to solve the problem in these unique revision worksheets.